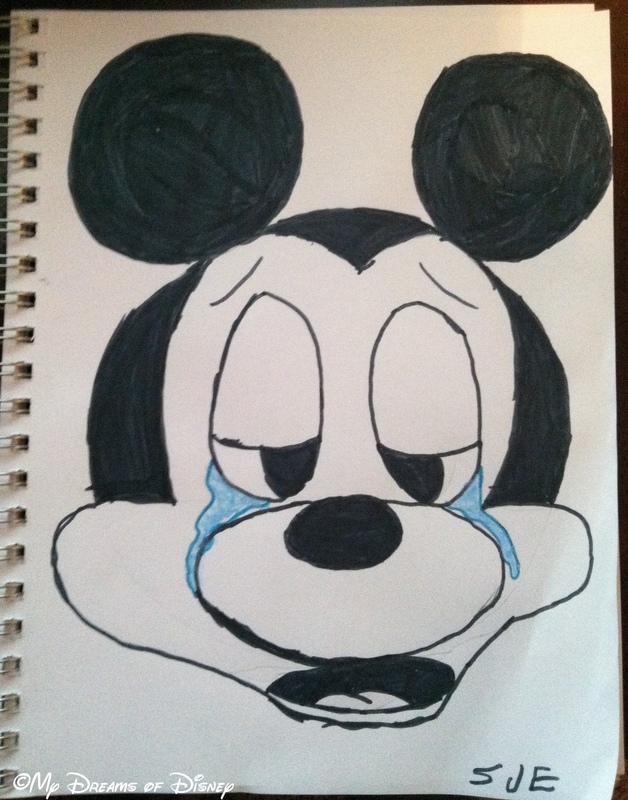 A Tearful Mickey Mouse – hand drawn by 11 year old Sophie. On Friday, December 14th, 2012, the small town of Newtown, Connecticut, was struck with a grief so intense, it has shaken a nation — even a world — to it’s core. On that morning, as you all likely know by now, a gunman came into Sandy Hook Elementary School and ended the lives of innocent lives. As a parent of an eleven year old, that news hit home. Part of me was thinking “How could this happen?” while another part of me was thinking “This was a movie scene, right? It didn’t really happen, did it?” Well, you all know that it did happen, and it is in the aftermath of such a tragedy that we struggle mightily to deal with the grief, and to try to explain to our children when they hear about it why such a thing could happen. When the world grieves, what, as a parent, can you do? I thought long and hard this weekend about whether or not to write a post — so much so that I haven’t posted anything since Friday to the site. In the end, though, I decided that, perhaps, if I did write about it, someone, somewhere that is grieving right now might take comfort in knowing that this little blogger and his family are thinking of them. No one right now is going through as much hurt as those families who have lost loved ones. But they have one thing going for them, as sad as it is for them to comprehend right now — their loved ones are in the arms of Jesus right now, and while they are left behind, Jesus has not forgotten them, and He is giving them the strength they need right now to get through this, as well as bringing his Peace upon them. it is far too easy to ask why in cases like this. It is really easy to be angry with God for allowing this to happen, and that is probably happening right now. I don’t pretend to have the answers about why this has happened, and I don’t think that we will ever really know why this happened. What I do know, though, is that our God is a loving God, that Jesus has won, even though it may not seem like it is so right now. It is really easy to let our grief lead us down a road that takes us into sin through anger, and if this is happening to you right now, please, PLEASE, get down on your knees right now, clasp your hands together, and pray to God to give you the Peace you need — the Peace that only Jesus can provide — so that you won’t give in to your anger and do something that could cause more grief. If you have sinned as a result of your anger, do the same thing — but first ask God to forgive you for your sin. He will forgive you. He always forgives those who ask forgiveness with a humble heart. The grief won’t go away anytime soon, I’m afraid. I know that it may seem like you want it to go away, that you want to just forget what has happened, but that isn’t what you should be doing, I believe. Forgetting the grief, blocking it away, will not allow you to heal, and that wouldn’t help. It is tough, but love always is, and saying goodbye, especially to your children, spouses, or other loved ones is never easy. Life will go on, though, although I won’t claim that it will be any better for a while, if ever. Your loved one is still gone, after all. I doubt that this has been helpful to any of you, but maybe I’m wrong. If this has helped you deal with your grief, then my objective was met. At the very least, please know that the entire nation, but especially Newtown, Connecticut, is in my prayers, and in the prayers of my family. God Bless Us, and God Bless the USA.